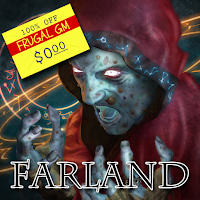 This week's Free GM Resource is a bunch of files/aids/"stuff" supporting the World of Farland, which is basically a 5th edition D&D game world/setting. .....and a lot of these files are more neutral anyway, so the edition isn't so important anyway. Since I'm highlighting Farland files I should try to explain the Farland setting, and the best way to do that is to lift a couple of sentences from the homepage: "Farland is a world that has been conquered by evil. It has been sundered into seven kingdoms, each ruled by an evil lord who personifies one of the seven deadly sins." That is enough of a hook for me! Personally I think the tools page is worth checking out for the 30+ NPCs alone, but there is a ton more to be had. If you like what you see you might want to shell out the $9.94 for both the Player's Guide and the GM Guide (the total for the two separate purchases).